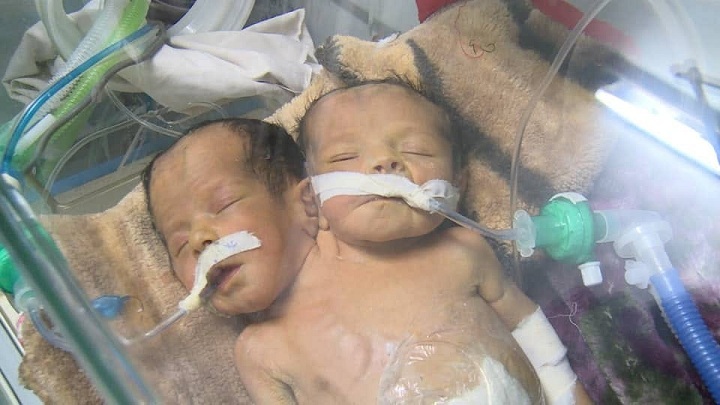 The Ministry of Public Health and Population announced, on Saturday, the death of the craniopagus Infants, conjoined infant Twins, due to the siege imposed by the Saudi-led coalition. The Ministry of Health mentioned in a statement that the Saudi-led coalition refused to open Sana’a airport to send them for treatment abroad, despite appeals launched by the ministry and doctors. This tragedy comes to reflect to the whole world the health and humanitarian situation of children in Yemen during the 4 years of aggression and siege. Dozens of civilians die every day because of the closure of Sana’a International Airport. “The two children have been deprived of the right to life, although there was great hope that they would remain alive. We also hold the coalition countries responsible for their deaths as well as for the United Nations,” the ministry said.